Thank you for visiting my vintage and antique watch repair site. Most visitors are here because they own an heirloom "family watch" and want to learn more about it's potential of being serviced and repaired. Most inherited mechanical watches were made in an era where the science of perfecting dependable timekeeping forced industry competition. The resulting jeweled watches are amazing and comparable to any science achievement in man's history. I encourage you to click through my antique watch repair site and learn more about my guaranteed mechanical watch services and welcome you to contact me. Allow us to restore your vintage mechanical timepiece with the devoted care and professional service every family heirloom timepiece deserves. We are not a production mechanical watch repair facility. We are a specialized shop, unhurried and uncompromising in our approach taken to repair and restore your early American and Swiss pocket or wrist watch. 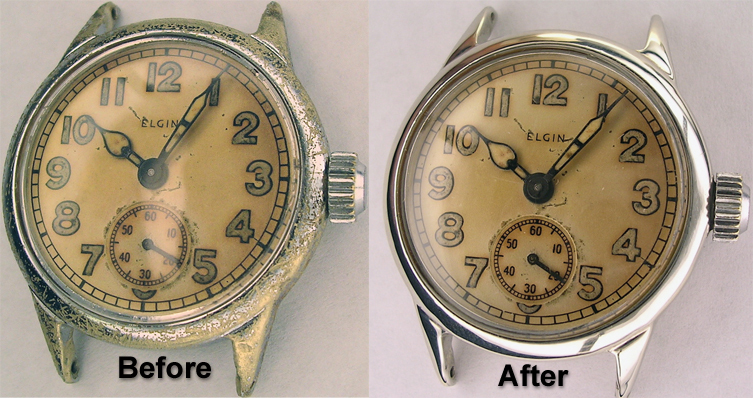 We provide pocket and wristwatch cleaning, restoration, overhaul and consultation. It's becoming somewhat difficult to find a local watchmaker these days, we know. We hear it all the time. One that specializes in the old mechanical watches from the hay day of Swiss and American watch manufacturing is getting even harder. This by the way, is our specialty. As a former Watchmakers Guild official, and out of respect for your local American Watchmaker, should you be in need of an antique watch repair service, check your local yellow pages first, and pursue his services first. If you run out of luck there, feel free to contact me. I'd like to gain you as a life long customer as I have so many families who know and respect what their mechanical watch needs and deserves.